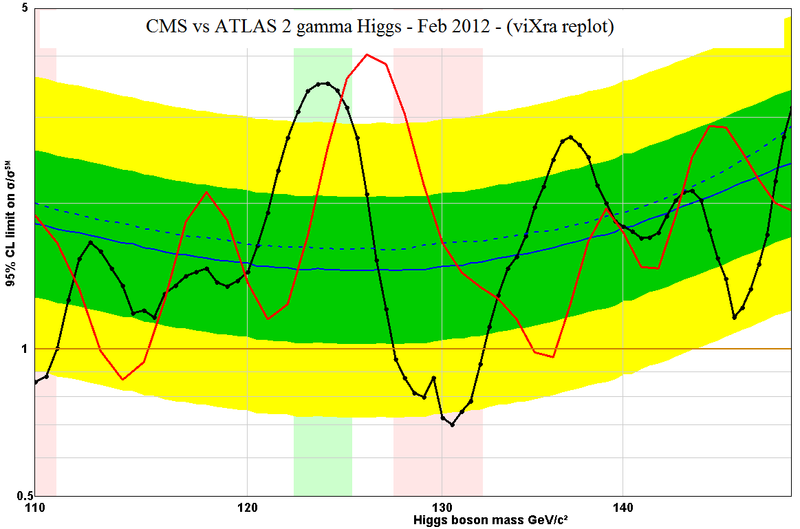 ATLAS and CMS have updated their Higgs publications based on last years data. These results were released rapidly at the CERN council meeting in December but since then they have had time to polish the reports and as a bonus CMS have added some new data into the diphoton channels. This has already been covered nicely on the other blogs including QDS, NEW, TRF, OPS and the best report from Resonaances which gives a nice account of where the extra events come from. 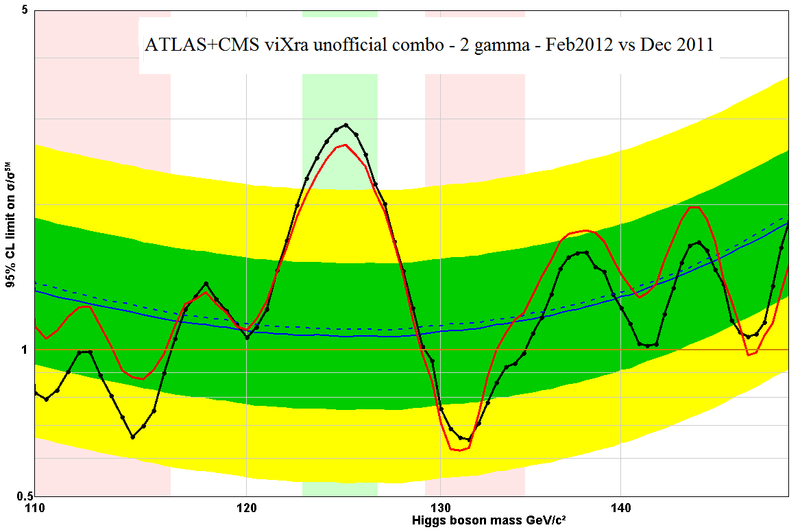 As you can see, the peak at 124 GeV is stronger while the other bumps have gone down. I have plotted this on a log CLs scale rather than the linear scale that CMS use because you need a log scale to read the significance properly. You can see that it has now gone up to 2.5 sigma for this channel alone. For comparison here is the same plot but with the results from ATLAS for comparison (which has not changed since December). If ATLAS looks better don’t forget that its expected value (the dotted blue line) is also higher so in fact the statistical significance is now about the same for both. One mystery is why the peaks are about 2 GeV apart. This could simply be a statistical deviation or it may be a sign that they still have some work to do on calibrating the calorimeters which measure the energies of the photons. The two experiments have different systems for detecting these photons. 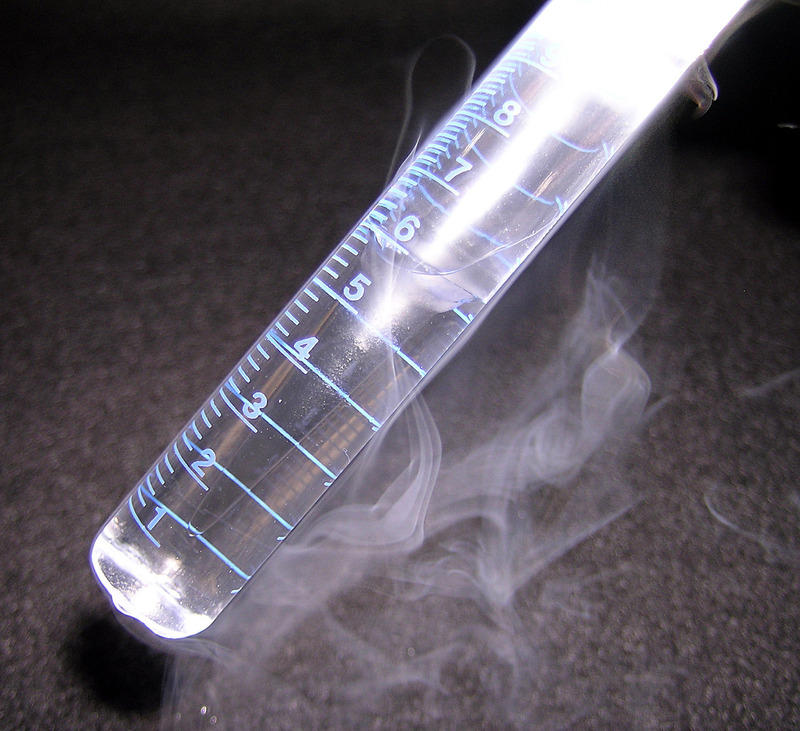 ATLAS use a tank of liquid argon, a clear liquid that looks like this. CMS on the other had uses some Lead Tungstate crystals which look like glass but are as heavy as lead. See this old article from Symmetry Breaking for the remarkable story behind them. When the CMS detector is finally laid to rest in about 40 years time they will be able to take the crystals out and make a great chandelier out of them as a memorial. Another mystery about the diphoton results is that the strength of the signal is about twice as strong as expected. This can be seen clearly in this signal plot. 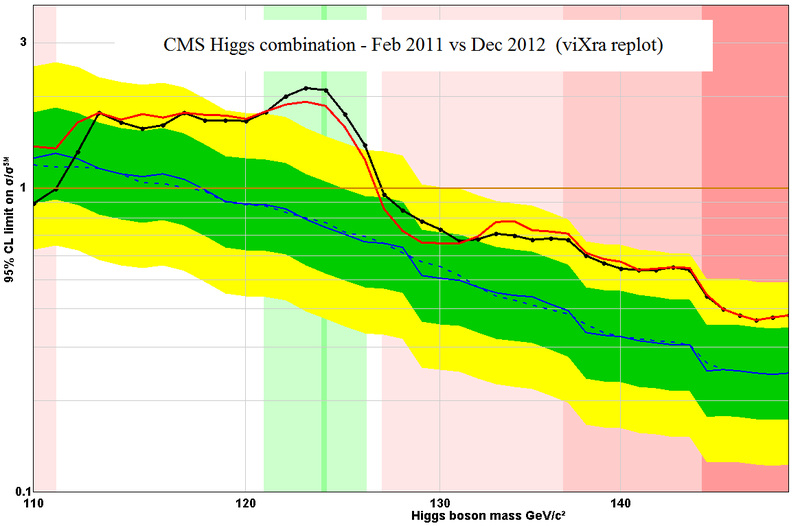 The excess over the standard model Higgs signal is about 1.5 Sigma for each experiment. It could be a sign that the particle is not as standard as expected, but more probably this is just a fluctuation that will go away with more data. It does mean that we should be cautious about how much we should expect the signal to improve if we double the data. It wont be as much as you might think and in fact the signal could get worse. This is why you should not expect conclusive results until all this years data is in. 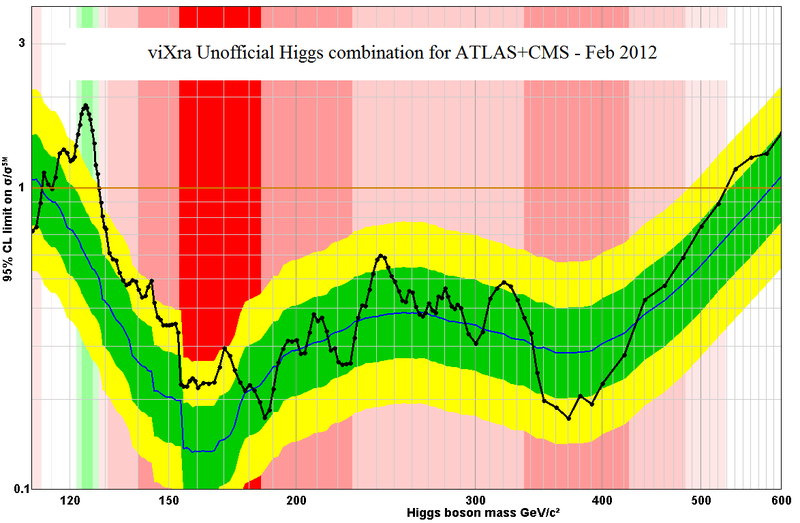 The unofficial Higgs combinations now need updating and here is the new ATLAS+CMS combo for the diphoton channel with the December version in red for reference. The significance is not as good as it would be if the two excesses coincided better in mass but it is now almost 3 sigma. The CMS all channel combination has also been updated of course. Here is a replot to show how it has changed vs the December levels in red. there is no change at higher masses. The significance on this plot has now just passed 3-sigma at the peak of the excess. The peak significance here has now reached about 3.5 sigma. I should remind you that this is an unofficial approximate combination that ignores correlations and un-normal probability distributions. The official version from the Higgs combination group should be due out soon. It will be similar but the differences are important. 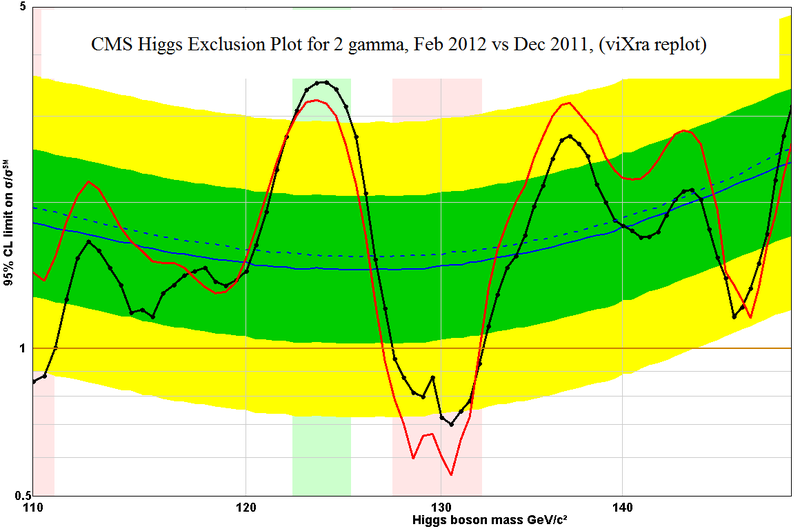 This entry was posted on Thursday, February 9th, 2012 at 1:35 pm and is filed under Higgs Hunting, Large Hadron Collider. You can follow any responses to this entry through the RSS 2.0 feed. Both comments and pings are currently closed. 1)Can a SM Higgs produce that signal? 2)Could a non-Higgs particle reproduce those data? 2) Yes but it would probably have to be a spin zero neutral particle with similar cross-sections as the Higgs. Nature would be playing a fine joke. How do the guys there measure the spin 0 of these events? E.g. the opposite polarizations of the two photons in the gammagamma channel? They can’t measure the polarisation of the photons so it could be a spin 2 particle, that is why I inserted the word “probably”. They can verify that it is really spin zero either by looking carefully at the angular distribution of the photons or by observing it decay to two fermions such as bb or tautau. That will require more data. It seems that there is a universal law of nature confirmed by all the recent experiments: every experiment paid with public money shows anomalies when turned off, even if for a short period to be upgraded. The interpretation of this seems to be related to a principle of survival of fittest to possible change of mind of politicians due to financial crises or austerity programs and to attract public money. All in all it is similar to the Higgs mechanism but applied to money rather than to masses. 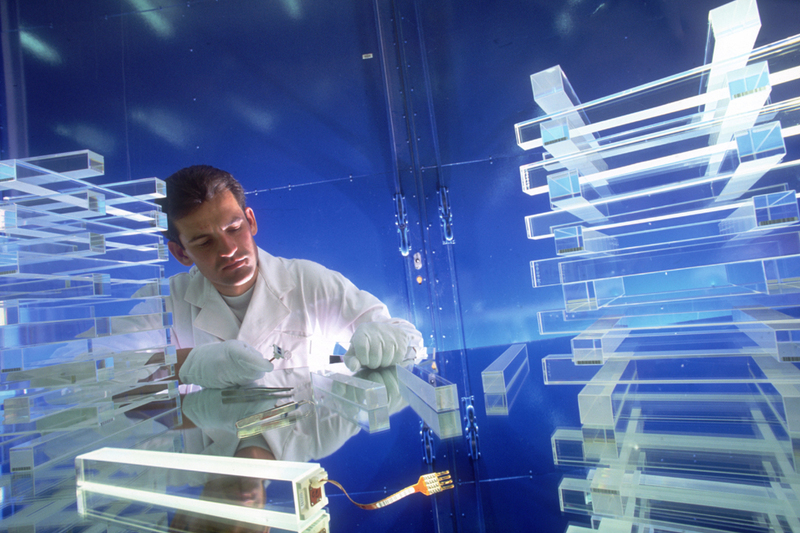 When the machine is shutdown, either for regular maintenance or because it has reached the end of its life, that is the optimal time for the physicists to do their most detailed analysis, firstly because they have a fixed sample of data and secondly because they are not occupied with running the detectors. It’s purely technical, not political. This doesn’t imply that every time that an experiment must be stopped for maintainance it has to show an anomalous deviation which regularly turns out to be a false alarm. Look at the history of Tevatron/LEP/LHC to see if that is true. These anomalies are political! Moreover the discovery is at 5sigma, an evidence is at 3sigma. 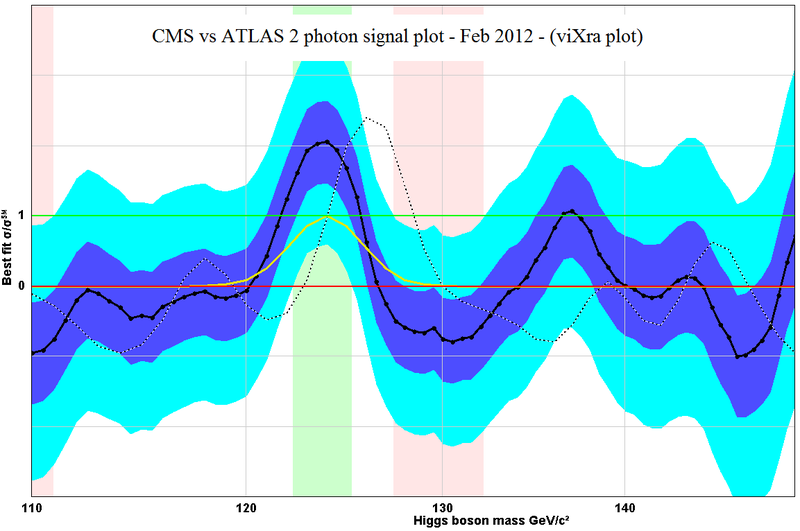 Having statistical fluctuations of 2.5sigma at 126GeV for ATLAS and 2.1sigma at 124GeV at CMS probably doesn’t seem to represent a Higgs evidence. We have to wait march at least. Maybe this feature should be added to physics blogs too 😉 ? The experiments are looking at large numbers of searches with a wide range of parameters space so it is almost inevitable that they should find weak “evidence” somewhere. This is called trial error. You seem to be suggesting that they should hide these results until discovery level evidence is produced. On the contrary they owe it to the public to report all results as soon as possible whether the result is negative, positive or inconclusive. Another reason to be open is that it gives a chance for other labs to look for similar effects. This may require modification to existing experiments, so while the results are hidden the chance to check them can be lost. Most of the people who read about such results can understand this, unless they get their info from poor quality media who fail to repeat all the caveats and put the level of confidence in perspective. As an example, for the Higgs results the CERN experimentalists have been rightly very cautious about the findings and the media have mostly reflected this. Not much new will be revealed by the LHC in March. It will be at least the summer before we know more. Theorists who think the Higgs boson is very likely to exist are rightly excited while those that are skeptical remain so. This correctly reflects the level of evidence produced so far.The experiments cannot claim discovery until they have enough evidence to convince all reasonable theorists. @Gibbs, I like jour posts. @Dilaton my post is malitious and needs a bit of sense of humor. the use of moderation in physics discussion is depreciable. It is essentially censorship. to scientific arguments you must replay with scientific arguments. To claim discovery or evidencies inphysics there are well established rules of 5 and 3 sigma….the rest is rumors damaging serious science. The significance of CSM and ATLAS must be calculated properly as Gibbs pointed out. Ps:@Gibbs, I like vixra becouse arxiv is deteriorating science, amplificating political rumors and comfortable myths. OK, I believe you that you get 3.5 sigma in combination by a straight combination, ignoring everything, but it really vastly understates the amount of evidence available at this point which is close to 5-sigma evidence. It’s pretty much guaranteed that CMS, ATLAS have a systematic difference DMH in the Higgs mass measurement of order 1 GeV and one should integrate over hypotheses where DMH is distributed around 0 with this 1 GeV variance. Only the integrand should be given by the naive addition of CMS, ATLAS shifted by DMH. In this more proper way, the integrand would really peak for the right shift and you would get a higher confidence which is closer to the reality. In the way you do it, it makes really no sense to add two detectors because ATLAS has 3.5 sigma by itself. I agree that a systematic error looks very likely. If the data could be shifted 2 GeV to bring the peaks together it would give a better result. If we knew the size of DMH we could do a combination on that basis and it would certainly give a better significance. I might do that later just to see how big it gets. However, that may overestimate the peak because there should be some statistical component to the separation too. If the peaks do not get closer with twice as much data we will know for sure. I dont think adding in quadrature is quite right. In fact it is not perfectly clear to me whether the significance should be read off the log CLs scale or the linear scale on the signal plot. It makes a difference as you go beyond 3 sigma. You probably have to use the pvalue to get it right and my combinations do not reproduce the pvalue plots as well. The logarithmic nature of the likelihood may come into play there, so I am reluctant to estimate values for significance as they get larger.